In every community culture plays a critical role increasing the quality of life and helping with education and sparking innovation. In Nipissing we are no different as our cultural activities and events act as outlets for our region and are as important to us as the roads we drive on or the pips that transport water. I heard a political figure once refer to culture as the life of a city. They stated that the streets and sewers were the structure or body of that town but the arts, culture and heritage made that body come to life. Community activation and engagement is one of the primary ways that culture replicates itself and works its way into everyone’s lives. An active community is a healthy community. Active engagement is the name of the game when it comes to the first week of May; which is National Youth Arts Week. NYAW is an umbrella group that allows communities to self identify their own youth based events and post them on the NYAW website and on the national map. It is very similar to Culture Days, which is happening this fall, but much more fun as it is specific to youth engagement in the arts. Arts groups or individuals are encouraged to publish their events on the NYAW website as a way of showing the level of activity that youth are producing and as an additional way of spreading the word about what is happening. The White Water Gallery has a pile of activities posted on their as well as other local groups making our region a hot spot on the national map. National Youth Arts Week runs from May 1st – 7th, 2014 and will have all sorts of activities taking place for all ages to engage in. Another Youth success story is the White Water Gallery’s Youth Arts Initiative. Over the past year many of the group have moved on to College or University making us proud with their academic achievements. 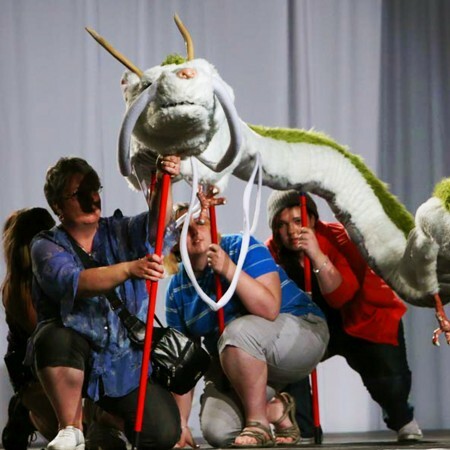 Recently they were invited to an exhibition, taking place in Toronto after they had won several accolades for their 20 ft long HAKU puppet at Anime North in 2012. Costume-Con is a travelling conference and competition that goes all over the world. It has been to Toronto once before in the mid 1990’s so you can see how rare it is for them to be coming here and for them to be inviting people to exhibit their works. Costume-Con took place last weekend and the YAI group participated fully. The whole project went great and landed them 2 awards in the Master Class category “Best for Class” for workmanship and they also received an honourable Award for Excellence. Its great to see our local youth participating and succeeding in the big city and I though congratulations for the YAI group was in order. If you wish to learn more about National Youth Arts Week please go to their website at: www.youthartsweek.ca. If you want to learn more about Costume-Con you and the YAI group you can visit their website by going to: www.costumecon32.com or by looking up the White Water Gallery Youth Arts Initiative on FACEBOOK.